February 2017: Please note that this feature was originally published by NASA Earth Observatory in August 2015. NASA's Climate Adaptation Science Investigator (CASI) program continues to study climate resilience at agency facilities. As the ocean has warmed, polar ice has melted, and porous landmasses have subsided, global mean sea level has risen by 8 inches (20 centimeters) since 1870. The rate of sea level rise is faster now than at any time in the past 2,000 years, and that rate has doubled in the past two decades. The nation’s problem is also NASA’s problem, and not just because several satellites and hundreds of Earth scientists are monitoring the rising seas. Sea level rise hits especially close to home because half to two-thirds of NASA’s infrastructure and assets stand within 16 feet (5 meters) of sea level. With at least $32 billion in laboratories, launch pads, airfields, testing facilities, data centers, and other infrastructure spread out across 330 square miles (850 square kilometers)—plus 60,000 employees—NASA has an awful lot of people and property in harm’s way. For NASA climatologist Cynthia Rosenzweig, the urgency of the problem was crystallized in the summer of 2009. As part of a climate change preparedness workshop, she joined other scientists, engineers, facility managers, and administrators on a tour of launch pads 39A and B at Kennedy Space Center. Since the Apollo-Saturn rocket days, and through 25 years of space shuttles, those two launch pads have been critical to NASA’s mission. But when Rosenzweig got off the bus and looked around, she could see that the shrinking dunes and damaged shoreline were just a stone’s throw from the launch pads. “NASA is on the coast because that’s the right place to launch from,” said Kim Toufectis, a facilities planner in NASA’s Office of Strategic Infrastructure. The U.S. government long ago made the choice to fly most of its rockets and experimental aircraft from the coast because failures happen, and they are less dangerous to the public when they happen over water than over land. But launching from the coast requires testing, storage, and spacecraft assembly facilities to be nearby. So if you are going into space from the United States, you are going to have to face down the challenge of rising seas. As at Kennedy, the launch pads and buildings at Wallops Flight Facility stand just a few hundred feet from the Atlantic Ocean. 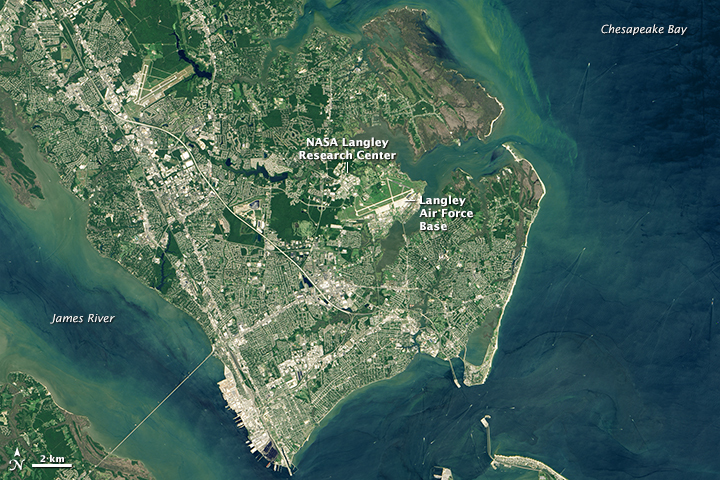 Langley Research Center is situated along the Back River, near the mouth of Chesapeake Bay. Ames Research Center is tucked into the south end of San Francisco Bay. 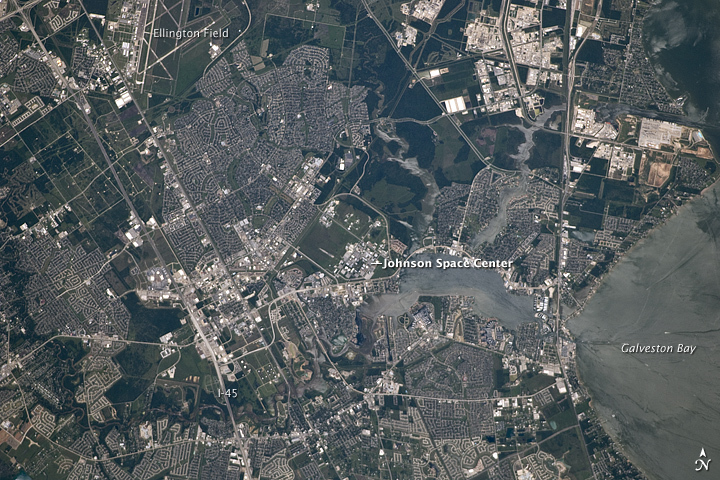 Johnson Space Center sits on Clear Lake, an inlet off of Galveston Bay. Those centers all stand between 5 and 40 feet (2 and 12 meters) above mean sea level. The math is nearly upside down at Michoud Assembly Facility, which sits behind levees near the Mississippi River and Lake Pontchartrain. Sea level rise of between 13 and 69 centimeters by the 2050s is projected for NASA’s five coastal centers and facilities…Even under lower sea level rise scenarios, the coastal flood event that currently occurs on average once every 10 years is projected to occur approximately 50 percent more often by the 2050s in the Galveston/Johnson Space Center area; 2 to 3 times as often near Langley Research Center and Kennedy Space Center; and 10 times more frequently in the San Francisco Bay/Ames Research Center area. NASA coastal centers that are already at risk of flooding are virtually certain to become more vulnerable in the future. These maps show (in red) areas around NASA centers that would be inundated by 12 inches (30 centimeters) of sea level rise. Explore this data using NOAA’s interactive sea level rise and vulnerability tool. If you think about the height of the sea surface like the height of the water in a calm bathtub, then a rise of a few tens of centimeters over a few decades doesn’t sound like much. But sea level doesn’t rise evenly; it piles up more in some places because of natural wind and current patterns. And turbulence matters: Think about that bathtub with a child sloshing around in it. Waves can roll up one side and then the other, sometimes splashing over the brim. The higher the flat-water line, the greater the chance that the water will slosh out of the basin when it is stirred up by storms and winds. Sea level also matters in a horizontal direction. An old rule of thumb is that 1 inch of vertical change in sea level translates into 100 inches of horizontal beach loss on a flat beach or marsh. In this way, a little bit of sea level rise can translate into a lot of water moving inland with storms or abnormally high tides. The high-tide line has been moving landward for some time at Kennedy Space Center on Florida’s east coast. 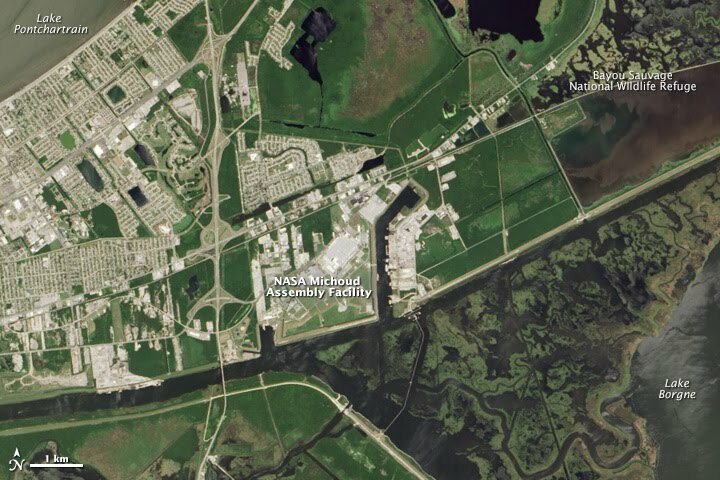 Located within the Merritt Island National Wildlife Refuge and adjacent to Cape Canaveral Air Force Station, NASA’s most famous center covers more than 66 square miles (170 square kilometers) and holds about 20 percent of the agency’s constructed assets. Most of it is built on coastal marshland about 5 to 10 feet above sea level. Conservative climate models project that the seas off Kennedy will rise 5 to 8 inches by the 2050s, and 9 to 15 inches by the 2080s. If ice sheets in Greenland and Antarctica continue to melt as quickly as current measurements indicate, those numbers could become 21 to 24 inches by the 2050s and 43 to 49 inches by the 2080s. “We consider sea-level rise and climate change to be urgent,” said Nancy Bray, spaceport integration and services director for Kennedy. Even as the space center was founded in 1961, management and scientists were aware that seas were rising and could someday pose a threat. But in that era, the challenge was to get to the Moon as soon as possible. There was an established Air Force station nearby with access to orbits that could not be obtained from anywhere else in the United States. The choice was easy, and it was right for the time. But time has not been kind to this stretch of sand. Based on historical records and aerial photos, the beach in front of Kennedy has thinned and moved inland by as much as 200 feet (60 meters). 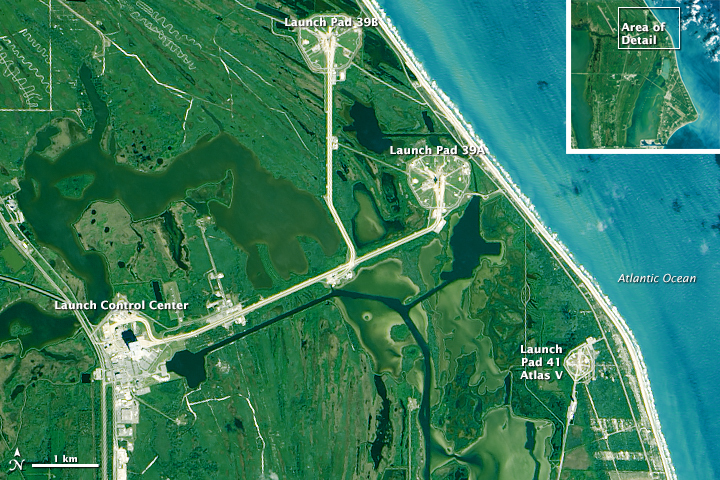 The losses have been most acute and persistent along a stretch near the center’s two most prized launch pads. Complex 39A was recently leased for 20 years to Space X, which intends to use it for its Falcon heavy lift rocket. NASA’s new Space Launch System and Orion spacecraft are slotted for Complex 39B within the next decade. The Atlantic Ocean stands less than a quarter mile from both. In 2004, three hurricanes crossed the Florida peninsula. And while none made a direct hit on Cape Canaveral, they collectively caused $100 million in damage to the space center. Then a nor’easter in 2007 sat offshore for two weeks and battered the beach front; Tropical Storm Fay then raked the beach in 2008. In response to the persistent storm damage, Kennedy facilities managers contracted to build a 15-foot-high, 725-foot-long dune as a proof of concept for a managed retreat. Center scientists and engineers also worked with the U.S. Geological Survey to map the shape of the beach (topography) with laser ranging and detection (LiDAR). Then they enlisted coastal geologists John Jaeger and Pete Adams of the University of Florida to figure out why sand dunes near launch Complexes 39 A and B were so persistently being washed away. For five years, Jaeger, Adams, and graduate students pulled GPS mapping gear up and down 6 miles of beach at least once a month — more often in the wake of storms. The goal was to build a three-dimensional model of the area. They found that the beaches were retreating due to the shape of the seafloor just offshore, where gaps between the sandbars channel wave energy toward certain areas. But they also found sand piling up (accreting) in other areas, mostly near Launch Complex 40. 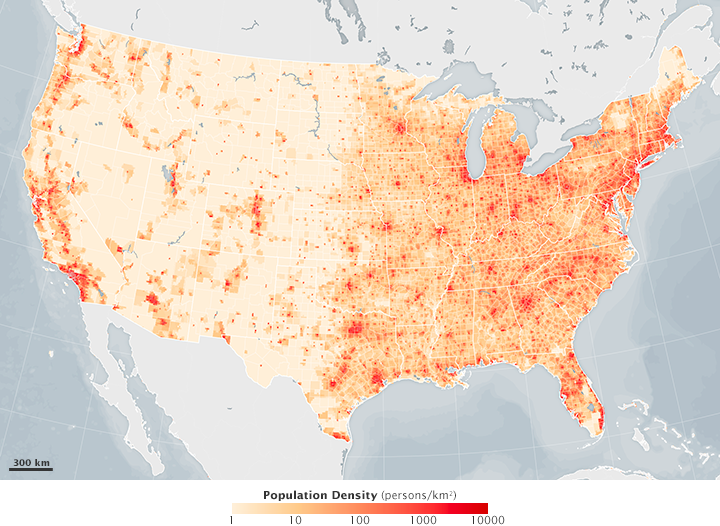 The beach is migrating south, even if NASA’s infrastructure is not. 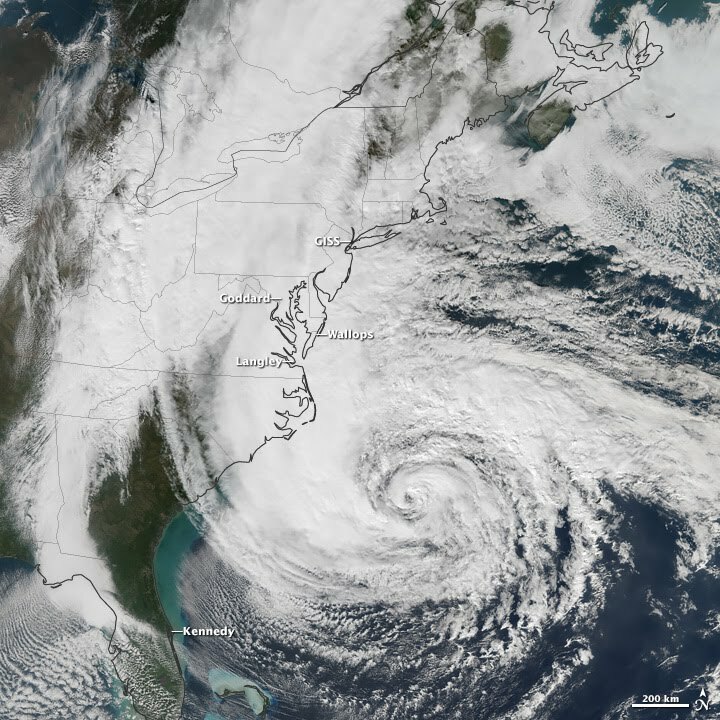 In 2012, Hurricane Sandy offered a glimpse of the new normal along the Atlantic coast. The storm passed 200 miles offshore from Kennedy, but it moved so slowly that the heavy surf scoured the beach for three or four high-tide cycles. By the time the skies cleared, the dunes along a 2-mile (3-kilometer) stretch near Complexes 39A and B had retreated as much as 65 feet (20 meters). Nearly 650 feet (200 meters) of railroad track in the vicinity of 39A were undermined by the storm surge. The high-tide line moved closer to a service road, under which lay some of the center’s natural gas, communications, liquefied rocket fuel, and water lines. That road sits just 4 feet (1.2 meters) above sea level. In the aftermath of Sandy, Kennedy Space Center shored up the beach again. Some of the railroad track was removed, and coastal engineers piled up 90,000 cubic yards of sand to create a 1.2-mile secondary dune. Roughly 180,000 plugs of native dune grasses and other vegetation were planted to hold the sand in place. So far, the dune has performed as designed, providing protection against storm and wave inundation and sea level rise for critical launch infrastructure. In the longer run, Bray and colleagues at Kennedy are working on what they call a managed retreat. They are building up the shore defenses, while also earmarking land farther inland for additional launch infrastructure should the demand materialize. The sea level concerns at Kennedy Space Center are the most visible, given the history and high profile of the real estate. But the issue touches the majority of NASA centers. NASA’s Wallops Flight Facility, carved out of coastal marshland on the eastern shore of Virginia, is most like Kennedy in its vulnerability. Wallops had a prominent role in the early days of spaceflight before settling into a quieter role for several decades. In the past fifteen years, the facility has been redeveloped for launching NASA and commercial rockets, including the 2013 LADEE mission to the Moon. 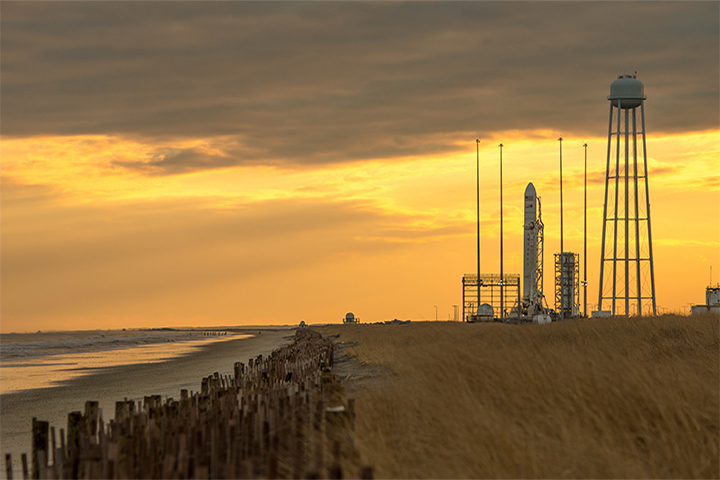 In the process, at least $1 billion in new spaceflight infrastructure has been set down along Atlantic shores. But Wallops sits amidst a barrier beach system, and those sand bars want to move. Erosion and beach migration has been reshaping the barrier island, Assateague, which sits north and east of Wallops. Assateague has been losing 10 to 22 feet (3 to 7 meters) of beach per year; Wallops Island has been losing about 12 feet. According to the Environmental Protection Agency, 50 acres (20 hectares) of surrounding Accomack County are turning from farmlands to wetlands each year. Hurricane Irene in 2011 did substantial damage to Wallops, leading NASA and local partners to redouble their efforts to hold back the tide. Coastal engineers built a sea wall 14-feet high and three miles long. By the time they finished in August 2012, more than 3 million cubic yards of sand had been pumped up onto the beach, part of a $43 million beach restoration project. A few months later, Hurricane Sandy wiped 20 percent of the sand that had just been placed. Another 10 percent washed away in the months that followed, and another $11 million had to be spent to fix the walls and the beaches. Situated near the third largest seaport in the United States and the nation’s largest naval base (Naval Station Norfolk), NASA’s Langley Research Center has to fight both rising seas and sinking land. Scientists have found that sea level around the Chesapeake Bay has been rising at 0.13 inches (3.4 millimeters) per year, twice the global average of 0.7 inches (1.7 mm) per year. Recent studies have shown that the landforms around the Chesapeake are sinking as a result of processes that started during the last Ice Age. When massive sheets of ice covered much of North America, the weight pressed down on Earth’s crust and mantle, causing subterranean, molten rock to bulge under the Chesapeake and other points south. When the ice retreated, northern lands began rising — rebounding — while the land to the south began subsiding again. The combination of rising waters and sinking ground means the Hampton Roads area (Norfolk-Newport News-Virginia Beach) could see 41 to 53 inches of relative sea level rise by the 2080s. That prospect has the leaders of both NASA Langley and the Langley Air Force Base planning to slowly move back from coastal flood zones. Scientists have surveyed the property with airborne lidar, and modelers have looked more closely at future projections for flood-prone areas. Old buildings are being hardened for tougher weather, and new buildings are being sited farther inland. Johnson Space Center lies within some of the most notorious hurricane territory along the Gulf of Mexico coast. 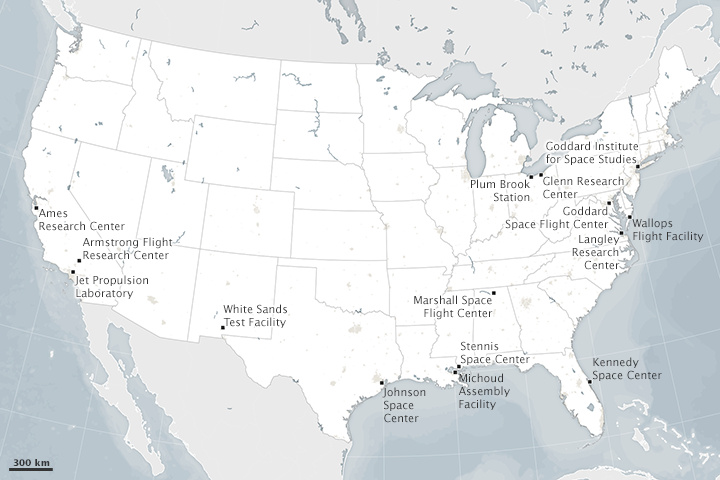 The primary NASA center for human spaceflight training and operations is particularly vulnerable to water hazards, including storm surges from hurricanes, flooding from extreme rainfall, and sea-level rise. While these hazards are not new to the Galveston Bay region, many climate change scenarios predict increases in the frequency and severity of such events in an area where sea level rise has been significant. Sea level has been rising nearly 64 millimeters per decade in Galveston Bay, significantly more than at any other NASA center. Hurricane Ike in 2008 provided an instructive dress rehearsal for future events. Ike was just a category 2 storm in terms of wind speed, but the 20-foot-storm surge was similar to what a category 5 storm would generate. Widespread power outages occurred in Houston, and the power loss and debris cleanup resulted in a week-long shutdown at Johnson. The experience spurred improvements to infrastructure, including new floodgates at key facilities like Mission Control and the protecting and raising of utility tunnel vents to better handle storm surge flooding. Then there is NASA’s home in New Orleans. Michoud Assembly Facility includes one of the world’s largest manufacturing plants, a 43-acre building where Saturn rockets and space shuttle boosters were once assembled and where the new Space Launch System will be pieced together. The facility provides deepwater access for ships that carry rockets across the Gulf of Mexico to Kennedy and Wallops. But Michoud stands behind 19-foot earthen levees on one of the lowest points in New Orleans. As at Langley, the land beneath the facility is subsiding, a result of the historical draining and compression of Mississippi Delta swampland that make the city. After Hurricane Katrina, the hardy facilities team at Michoud had to pump more than a billion gallons of water out of the facility. According to NASA’s CASI report, sea level could rise 30 to 34 inches around Michoud, even under conservative estimates. That’s a much higher water line for Mother Nature to build upon when future hurricanes blow in. So what does NASA do as the seas rise around its facilities? Cynthia Rosenzweig has an answer: flexible adaptation pathways. Rosenzweig conducts her research at NASA’s Goddard Institute for Space Studies and Columbia University, both of which stand on the Hurricane-Sandy-hardened streets of New York City. For years she worked with city and state leaders to assess the impacts of climate change and to develop risk reduction strategies. In 2009 she was asked to bring her experience to NASA’s Climate Adaptation Science Investigators Working Group, an effort prompted by a presidential order to evaluate “risks and vulnerabilities" at every federal agency. “It may be the first time NASA’s scientists and managers have worked together to manage climate risks to our facilities and natural resources,” Rosenzweig said. Together with state and local officials — as well as federal, military, commercial, and conservation partners — CASI has set out to brainstorm what kind of information is needed by facilities managers, as well as what kind of response might be required. The CASI team translated international reports and projections — such as the Intergovernmental Panel on Climate Change (IPCC) or the U.S. National Climate Assessment — into practical, regional-scale advice for the NASA centers. They conducted environmental impact studies and modeling to project how much sea level could rise near each facility. They examined past and future land use changes around centers, even considering how sea level rise might affect the endangered and threatened species that find havens on NASA property. “How do we fight Mother Nature for another fifty years?” said Kim Toufectis. His colleagues at each center and in the Office of Strategic Infrastructure — people with skills in civil and chemical engineering, urban planning, real estate, facilities construction and maintenance — must now weigh their options and develop long-range plans. In some places, they will need to design smarter buildings; in others, they will retrofit and harden old infrastructure. If a facility must stay within sight of the water, then maybe the important laboratories, storage, or assembly rooms should not be on the ground floor. For the launch facilities, which must remain along the shore, beach replenishment, sea wall repair, and dune building may become part of routine maintenance. But across the space agency, from lab manager to center director to NASA administrator, people will have to continually ask the question: is it time to abandon this place and move inland? It’s a question everyone with coastal property in America will eventually have to answer. To learn more about NASA’s efforts to study sea level rise, click here. Earth Observatory would like to thank Cynthia Rosenzweig, Dan Bader, Will Stefanov, Kim Toufectis, Nancy Bray, Bill Patzert, John Jaeger, Peter Adams, and Patrick Lynch for editorial and reporting help. Adams, P.N., and Jaeger, J.J. (2013): Monitoring Shoreline and Beach Morphologic Change at Kennedy Space Center, Cape Canaveral, Florida — Final Report. University of Florida. 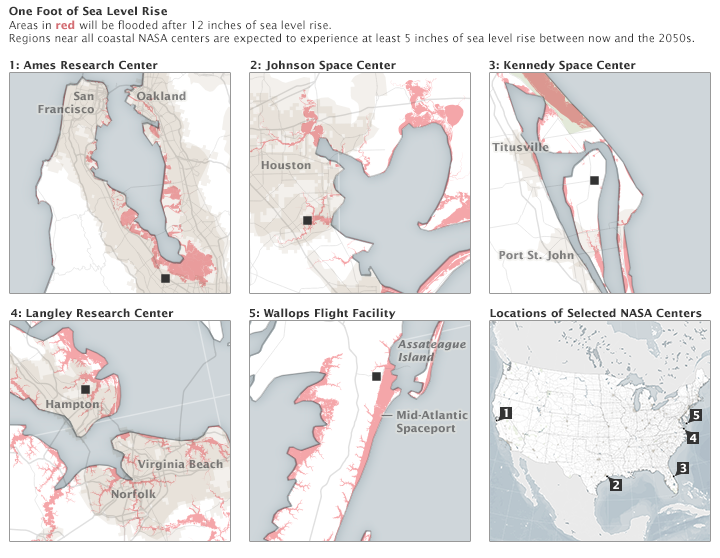 Agence France Presse (2014, May 20): Rising Sea Levels Are Destroying NASA’s Multi-Billion Dollar Facilities. Accessed August 14, 2015. Dawson, C., and Proft, J. (2012): Lessons from Hurricane Ike: Predicting Storm Surge. Texas A&M University Press. DeJong, B.D., et al. (2015): Pleistocene relative sea levels in the Chesapeake Bay region and their implications for the next century. GSA Today, 4–10. 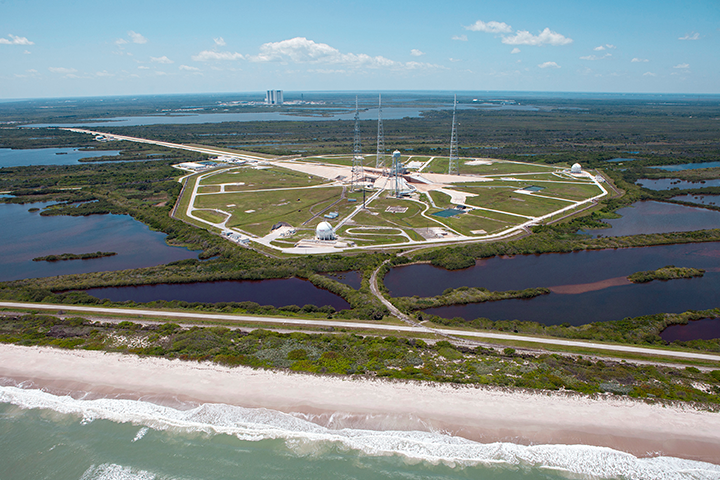 Florida Today (2015, June 18): Erosion threatens iconic NASA launch pads. Accessed August 14, 2015. Florida Today (2015, July 28): Wall Street heavy hitters warn about climate change. Accessed August 14, 2015. Government Accountability Office (2015, July): Army Corps of Engineers: Efforts to Assess the Impact of Extreme Weather Events. Accessed August 14, 2015. 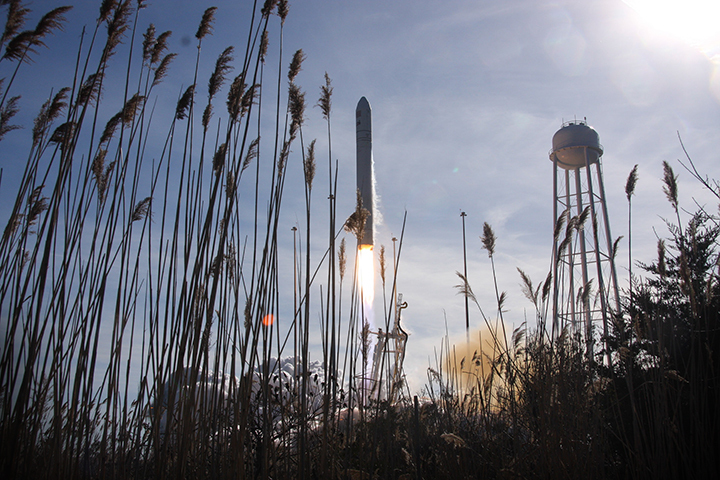 NASA (2013, March 5): NASA Wallops Recovery Continues from Hurricane Sandy. Accessed August 14, 2015. NASA (2015, June 25): Hurricane Preparedness: Ten Years After Katrina. Accessed August 14, 2015. NASA (2015, April 10): ODU Professor Believes We Should Prepare for Worst-Case Sea Level Rise. Accessed August 14, 2015. NASA Kennedy Space Center (2015, March): Environmental Assessment for KSC Shoreline Protection Project (draft). Accessed August 14, 2015. 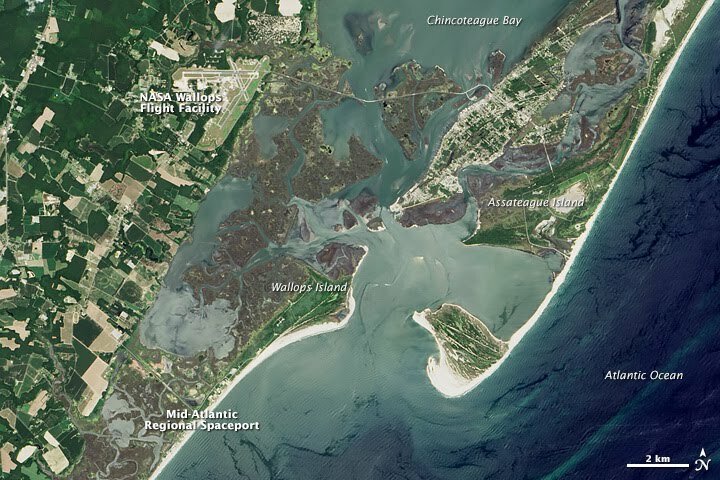 NASA (2014, August 1): Restoration of Protective Shoreline Completed Near Launch Pads. Accessed August 14, 2015. The New York Times (2015, August 8): How to Save a Sinking Coast? Katrina Created a Laboratory. Accessed August 14, 2015. Oak Ridge National Laboratory (2009): Langley Air Force Base: Vulnerable to Sea Level Rise. Accessed August 14, 2015. Reuters (2014, September 4): Water’s edge: the crisis of rising sea levels. Accessed August 14, 2015. Risky Business Project (2014, June): The Economic Risks of Climate Change in the U.S. Accessed August 14, 2015. Rosenzweig, C. et al. (2014): Enhancing Climate Resilience at NASA Centers: A Collaboration between Science and Stewardship. Bulletin of the American Meteorological Society 95, 1351–1363. University of Florida (2014, December 5): Climate change already showing effects at Kennedy Space Center. Accessed August 14, 2015. U.S. Department of the Interior (2015, June 23): Interior Department Releases Reports Detailing $40 Billion of National Park Assets at Risk from Sea Level Rise. Accessed August 14, 2015. U.S. Global Change Research Program (2014): National Climate Assessment: Sea Level Rise. Accessed August 14, 2015.